Greta Pontarelli, 66, won her fifth world title in aerial arts at the IPSAF World Championships in Torino, Italy, Sunday. Her artistic performance, “Finding the Magic to Make Your Soul Soar,” secured her first place win in the Masters Division. "Don't let age or any limitation keep you from passionately pursuing your dreams." Greta Pontarelli, 66, won her fifth world title in aerial arts at the IPSAF World Championships in Torino, Italy, Sunday. Her artistic performance, “Finding the Magic to Make Your Soul Soar,” secured her first place win in the Masters Division. Pontarelli began the art of pole dancing at 59, and was soon entering pole sports and pole art competitions internationally. At 61 she scored the first of a succession of wins in the United States and abroad, 19 wins to date, five of them world championships. What is Pole Sport, Pole Art? 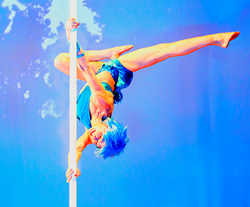 Pole Sport and Pole Art are combinations of gymnastics, choreography, and acrobatic tricks. The sport requires significant strength, flexibility and stamina, and employs athletic moves such as climbs, spins, and body inversions using the limbs to grip a vertical standing apparatus. Pontarelli says her best trick is to execute a deadlift handspring and go to a passé Iron-X on the pole, which demands extreme control and strong core muscles. The long term goal of Pole Sports and Pole Art is the inclusion into World Games and the Olympics. As a teen Pontarelli competed nationally in gymnastics and was named the Pennsylvania Floor Exercise Champion. She won national awards as a martial artist in sparring and forms in 1978. Pontarelli competed twice on the TV show American Ninja Warrior and was the oldest person to ever attempt the course. She founded an international life coaching business in 1997 to enrich the lives of others and help to believe in themselves. Pontarelli lives by the motto, Carpe Diem, seize the day. She resides in Temecula, CA, with her husband. Read more about Pontarelli at http://www.aerialzen.com, http://www.facebook.com/gretapontarelli and http://www.instagram.com/aerialzen.